Do you Need an Aisle Runner? 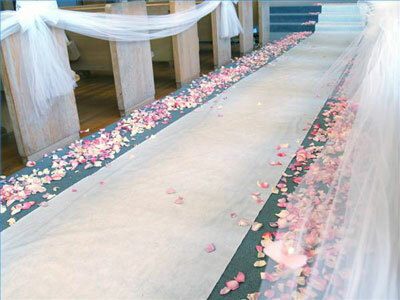 An aisle runner is a long strip of fabric (cloth or vinyl) which is placed along the path the bride will walk to reach the "altar" or her groom at the wedding ceremony. Aisle runners were first used long ago, before asphalt and cement, when walking on dirt was the norm. In order to protect the bride's garment from being soiled, a long piece of cloth would be placed in her path. Nowadays, aisle runners are used for many reasons. Brides still consider it necessary for keeping the dress clean of soil etc during outdoor ceremonies. For indoor events, the aisle runner adds an extra element of decoration to the ceremony location. Aisle runners come in a variety of fabrics ranging from delicate silk and lace to more sturdy polyester and vinyl. Choosing the right fabric for your wedding's aisle runner depends heavily on where the ceremony will be held. For example, outdoor ceremonies require that the runner be made of a sturdy fabric that can withstand heels on soft grass, as well as the rigor of rough cement. Indoor ceremonies allow for more delicate fabrics. Keep in mind, however, that if the carpeting or flooring at your venue is less than perfect, you can definitely hide their imperfections with a heavy fabric in the aisle runner. After all, the runner will only enhance the bride's appearance as she makes her way to the altar, whereas a substandard floor will distract from the overall look. For many couples, the aisle runner represents yet one more opportunity to decorate the ceremony location and add further personal touches to their event. With this in mind, they look for something special in the runner to address the décor dilemma. © Customized Wedding Creations, N.J. The only Canadian supplier of personalized aisle runners that we know of (and all sorts of other personalized wedding supplies actually) is A Timeless Celebration. (see their photo in the gallery, below?) They're Montréal-based, but ship everywhere and have online ordering too..
After you have decided on using a runner for your ceremony, you will probably have to decide whether you will buy or rent one. In many cases, your wedding planner or decorator will have access to an aisle runner and you could very easily include it as one of the services he/she will provide for you. If it is cost efficient, this might be the most convenient option. Another rental option for many couples is to rent a runner or go the DIY route, which has its advantages and disadvantages. Obviously, it is much cheaper to go this route. However, you would have to delegate someone to set it up for you. This, of course, can get a little unsettling because you will have to make sure you find someone responsible to be at the ceremony location early enough to set it up and to stay after the nuptials to remove it and safely store it for you. Also, keep in mind that there may be some fees for damage for excessive soil on the runner; so, make sure you are clear on all the costs up front. Where to Start Looking for a Rental? plain, fabric, plastic and personalized. With customized, the couple keeps it; all else, available for rent. If you decide you would like to make your own runner or to buy your own, make sure you are 100% clear on what type of fabric is best suited to your ceremony location. That includes the width and weight of the fabric. Also, you will have to determine the length that would cover the area you will be walking from the entrance to the altar; so make sure you buy something long enough. Although purchasing your runner is often a little more expensive than renting, the major advantage of buying over renting is the personalization option. When renting a runner, you have little or no opportunity to add your personality to it. Your ceremony will typically last anywhere from 15 to 45 minutes and it is by far, the shortest segment of your wedding day. However, it is the reason you are there, is it not? Even though you may have allocated all or most of your décor budget to the reception, it is important to give some thought to the ceremony itself. An aisle runner offers an excellent opportunity to add formality, elegance, and personality to this portion of your day.